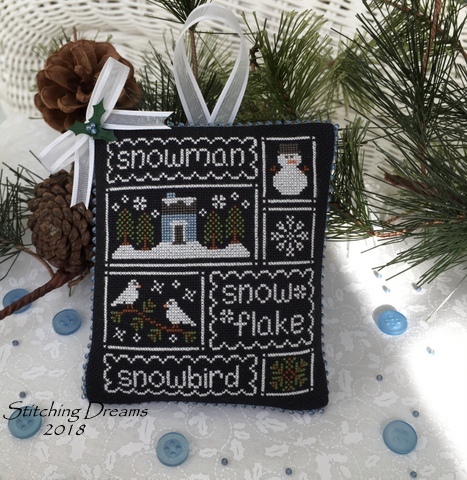 Stitching Dreams: January is over! Yay! The end of my least favorite month has arrived... I always welcome short February because I know March follows and the days get longer and the temperatures begin to warm up. January has been one busy month which I'll fill you in on after I show you my latest stitching. But first, as always, thank you, thank you for your sweet comments on my last post. My middle son tells me that his cat, Spike, is getting quite the swelled head after reading all of your kind remarks about him. He really is such a fun cat... we were visiting with him on Sunday and he was all personality, that's for sure! I finished my very first monthly ornament for 2018 and I love how it turned out. I spotted the Country Cottage Needleworks chart called "Snow Sampler" and thought how lovely it would look stitched on black. But, with a stitch count of 125 X 82, it really seemed way too big for one of my ornaments. Hmmm... what to do, what to do? Well, I decided to eliminate the top and bottom borders of pine needles and stitch it "over one" on black 28 Monaco. That did the trick! The white stitching really pops on the black! The finished ornament with its blue bead edging measures just 4 inches by 3 1/4 inches--perfect! I used an overdyed blue thread for the house rather than the suggested brownish/gold color and also gave it a little chimney. Oh, let me tell you--this one took a while--those beaded edges are a lot of work because you have to run a border of straight stitches all the way around both the front (as you can see above with the line of blue stitches) and the back and then stitch on the beads. (If you'd like to try a beaded edge, this tutorial is very helpful). But, the end result is so lovely. I also added a small white bow with a bit of greenery and three blue beads to finish it off. I have two other ornaments to share today--these were both sent off as Christmas gifts in December. The first one went to my friend, Gabi, and yes, I have stitched it many times before. It is just such a classic and I never tire of it, though. You'll recognize it as a Prairie Schooler design from Book No. 23: "A Christmas Year II." This was stitched on a piece of 32 ct. mystery linen with the suggested DMC threads. The main change I made was to simply turn it on the diagonal for a very different look than is shown on the cover of the chart. Gift for Gabi from PS "A Christmas Year II"
And to my friend, Robin, went my final Prairie Schooler ornament of 2017. This one was stitched on 32 ct. flax Belfast with the suggested colors except for the color of Santa's robe... I used DMC 3764. I also substituted a branch of holly for the charted doll in Santa's left hand and eliminated the blue rectangular border so I could finish it in an oval shape. I'm sure this handsome blue Santa is very happy in his new home in Virginia! I've stitched a few more things this month, but they aren't finished/finished so I will, hopefully, have those for you next time! So, on to my January. Well, first of all, another birthday has come and gone. Sigh... they just keep coming faster and faster for some strange reason. This year's celebration was very quiet as it was just me and my husband. It felt very strange having none of my sons around for the first time ever. But, my husband spoiled me with cake and candy and a lovely assortment of charts which will keep me busy for years to come... A generous gift certificate to 123 Stitch arrived, also; I'm sure I'll have absolutely no problem spending it! My oldest son and daughter-in-law also sent me a gift certificate to 123 Stitch and my youngest son sent these tasty cupcakes from Georgetown Cupcake. We couldn't possibly eat all 12 ourselves (well, we could, but you know the end result of that!!) so we froze six of them and then took those to my middle son's apartment Sunday for a belated birthday celebration. He and his girlfriend made a very tasty chicken dinner with homemade bread, fruit salad, and a beautiful "beets and sweets gratin" for us. Really nice to have someone else cook! And it was fun to play with their cat while they prepared dinner, too. I received two lovely gifts from blogging friends, as well. From June came the prettiest soft blue and rose scarf, a scented sachet for my drawers and a little gold box kit that I can add some cross stitching to the top. Thank you, my sweet friend--that was so very sweet of you! The other thing that kept me so busy was a trip to Florida for five days. This was not for pleasure, though. 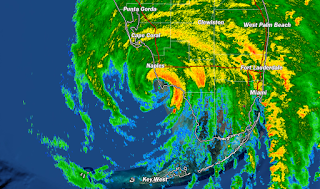 I think some of you will recall that my in-laws' home was quite damaged when Hurricane Irma decided to pay a visit to southwest Florida back in September. Much of the drywall had to replaced, cupboards and closets rebuilt, and the roof repaired. All of their upholstered furniture and both cars were lost along with some shoes, clothing, and other miscellaneous items. Anyway, my husband and I flew down to southwest Florida earlier this month in an attempt to make a newly renovated house feel like a home again. We rented a bright blue pick-up truck and raced from consignment shops to thrift stores to home stores picking up a kitchen table and chairs, mattress, bed, dresser, mirror, TV stand, rugs and other basics to provide his parents (who will both turn 90 this year) with the basics. I quite enjoyed the consignment shops as that part of Florida (Naples) has amazing ones! (I wished I could have spent more time looking for myself, but that wasn't what we were there for). In addition to the shopping, we cleaned lots of drywall dust, emptied bags and boxes, did loads of laundry, and connected phones and televisions. In other words, we worked from dawn until we fell, exhausted, into bed each night. We never even saw the beach or took a walk in the sunshine. But, my in-laws are now settled in Florida once again and I hope that, as time goes on, their new house will feel more like home to them... As you can imagine, this was quite an upheaval for two people their age. *** Are any of you fans of "This Is Us?" Oh, the last few minutes of the show that aired on January 23rd had me watching with tears streaming down my face as this song played. *** I'm reading an excellent book, The Invisible Bridge, by Julie Orringer; an epic novel (at over 600 pages) of life in pre-World War II Paris and the horrors of the Holocaust. It centers around a family with three sons, so, of course I'm drawn to it! *** I just ordered two more hardcover books of my blog posts from Blog2Print. With a 50% off coupon offer, I couldn't resist. I combine two years into each book to save money, so with the previous two books that I ordered back in 2015, I will now have every year (except 2017) in print. My blog is not only a journal of my stitching, but of my travels, recipes, and family events, too, so I will love having these books to read in my old age. *** I've become addicted to making (and eating!) granola because of this great recipe! Bet you can't eat just one bite! I love all the ornaments and with all the birthday gifts, will you have time to volunteer? Looks like you need to get stitching. :) I just started the Homestead Christmas series by Little House. it is so cute...looking forward to seeing the rest of them. I have been a stay at home wife and mom so retirement is rather like my eveyday life Carol. Now that my husband is semi retired, life is different and it is taking some getting used to! I think volunteers are always welcome...several of my friends volunteer at the local library as Friends of the Library. A few volunteer at church or faith related ministries. I am still helping with my grands so I have to plan things around that. I am sure you will come up with a plan. Oh Carol, I could write a book about retiring. It is not the easiest thing to do. You have had a set plan for life for so long and then ...bam, you are home with things to do, but I have found it hard to manage my time. After the third year of floundering and TONS of unexpected life events that had not been in my retirement plans, I have learned to plan my days a bit better and feel like I am not wasting moments. I am finally finding the balance of fun with organized days. It will come. Happy belated birthday...Isn't 123 Stitch wonderful? That is what I asked got for Christmas. Their wishlist is wonderful. Loved seeing all your days and plans. I can't even imagine what your in-laws went through. Mother is going to be 83 in March. I moved her down here almost two years ago. She has had to start over. IT is hard at that age. I do not really like January - always cloudy, wet and foggy. Hardly any sun. You drive to work in the dark and get off work in the dark. Very nice looks your new work, on black fabric I have not embroidered. Respect. And the finish is perfect. 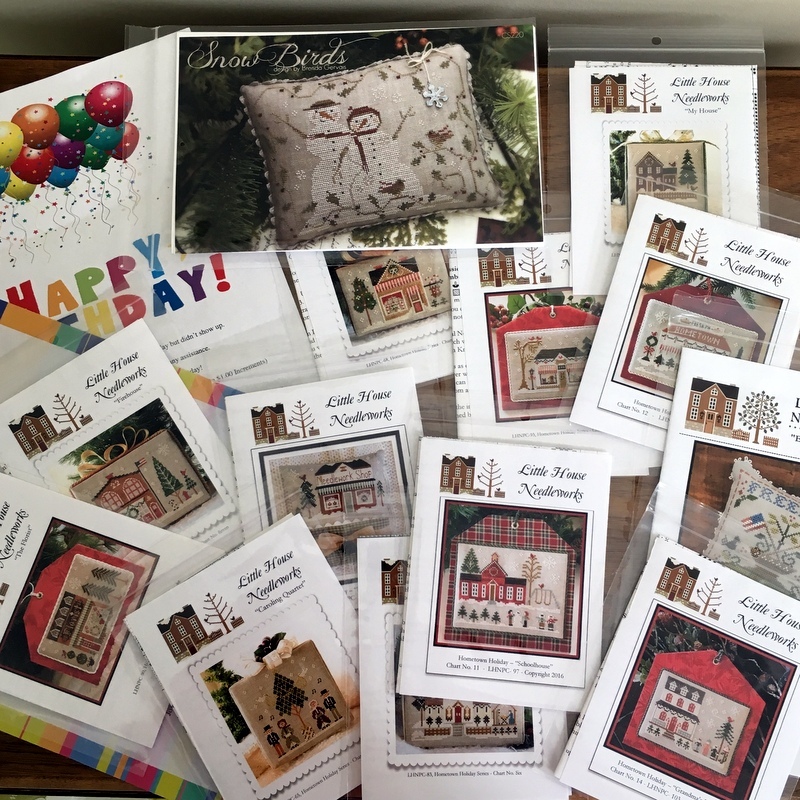 Oh what nice templates, a few I know, Main Street series by LHN, of which I have already embroidered. Happy Birthday, I hope you enjoyed your special day. Your ornament for January is just stunning on the black fabric, Carol. Way to go! I thank you again for my fabulous PS Santa. It looks like you had a wonderful birthday; what lovely gifts you received. I enjoyed reading your "random thoughts" at the end of your post. 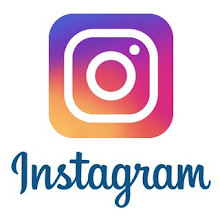 Carol, thanks for a jam packed post with lots of thought provoking ideas. I retired a little over a year ago and have just been "winging" it. I feel like I'm always busy but can't tell you what I've been busy doing...psst...stitching IS somehow involved. I love your snow piece; it definitely pops on the black linen. Your blue Santa is perfect for Robin since she lives near the Blue Mountains of Virginia. A belated Happy Birthday, I know you'll enjoy your thoughtful gifts. You are a blessing to your parents..what a terrible life event to undertake at their age! I watch This is Us but am behind on episodes; I will have to start catching up quickly. I hope you continue to enjoy your retirement, whatever you decide to do! So much to comment on. Sorry this will be long haha. I just love your ornaments. The Snow Sampler on the black is just perfect! I love that way of finishing an ornament sized piece. It doesn't involve a sewing machine and that makes me very happy yes it does take some time but it's easy to do. Wow what a wonderful stash for your birthday. By the way Happy Birthday! The cupcakes look yummy. The gifts you received look fantastic. I'm glad you were able to get your in-law's home back into shape. How sweet of you guys to do all that. I'm sure it is very appreciated. I say enjoy your retirement. Who says it's a waste to spend the day exactly how you want to? You deserve it. Yes I LOVE This is Us. I'm not a fan of shows that make me cry but Oh this one is fantastic. I use Blog2Print too. So neat to have your journal printed out to read. I'll keep your son in my thoughts. LOL Okay I'll shut up now. Have a great rest of your week and weekend! Sorry I missed your birthday! Your husband sure knows how to pick charts. Over one on black has to be difficult and what a result! Gorgeous, and turning the other ornament was a great idea. Thanks for sharing your life with us, another enjoyable post. Must check that recipe! It looks like you had a very lovely birthday. I love your finish on the black fabric and your Prairie Schooler ornaments are beautiful. Your sampler is gorgeous. I really like the way the light colors pop on the black fabric. We watch "This is Us". I can't wait for the episode after the Super Bowl although I'm going to have tissues handy because I know it will be very emotional. I read on two news sites that after the episode on 1/23 aired, people took to social media revolting against Crock Pot. It was so bad that the company had to issue a statement that this was a TV show and not reality. Crock pots are a low wattage appliance and there's been no deaths associated with them. Oh my goodness. I never would have thought this would be necessary! When I first quit working completely I had a grandchild (then two, then three...) to fill my time. Now that they're getting older I find myself in a similar situation to you. I'm eager to see how you choose to fill your time. Ah, two of my favorite kinds of stitching and finishes, on black and an oval shape! They look great. I'll be saying some prayers for your son's safety 7,000 miles away. Wonderful gifts from stitchy friends. Happy Belated Birthday Carol! I too just turned a year older two days ago. Those cupcakes though! My daughter made me a red velvet cake, my favorite. I hope you find your stride in retirement. Maybe a volunteer position will help. I said What now? to myself when my daughter left home. Have a great day with a lot of stitching! Hi Carol, belated birthday wishes to you! Your ornaments are beautiful! :) Love the stitching on the black fabric. Lovely gifts from your friends and husband. Good to know that your in-laws' home is settled again. Yes, I too watch This is Us and I like it. You have received so wonderful gifts for your birthday - and you all deserve it. It's not only that you have many wonderful charts for years to come - we also will have the pleasure to get pictures of your wonderful finishings for years! I am so sorry, that you cannot enjoyyour retirement as much as it should be. But I am sure, this is just a matter of time. You will find your new life schedule and than you wohn't have the feeling that you waste your time. I really hope and wish, that this will happen very soon, my dear friend. Sending all the best wishes your way! Carol, 3 gorgeous ornaments!! I'm so inspired by you to try my hand at stitching on black, the white certainly pops and such great adaptations. Happy Belated Birthday!!! Such thoughtful gifts you received from Cindy and June. YOur husband certainly spoiled you too!! Happy belated Birthday Carol. I hope you had a wonderful day. So beautiful gifts from your blogfriends and so many patterns from your husband. Your new ornament looks great. I have never stitched on black fabric. The two ornaments are lovely gifts for your friend. Belated Happy Birthday Carol. Lovely birthday gifts. Congrats on the great finishes as always. Dear Carol, all for birthday! White stitch on black is unusual, you like me! She got a beautiful gift from her husband! I understand you, you still want to work, even if you are good for society. I also teach :-) The work of the librarian is interesting, I have a book of advice. I'm looking for a nice February! Happy belated birthday! Amazing haul...what a generous husband you have. And a book of your blog posts...what a treasure that must be...with all you add to your posts, it really is a wonderful journal. I retired about 5 1/2 years ago and I really love being home...I'm a retired RN and the nursing profession had changed so much for me..I'm an introverted, love to be alone person, so it suits me well. Sometimes I wish I was more outgoing...I would probably attend some of the wonderful stitching retreats ...there are so many in the mid-west and the south, but travel has never been enjoyable to me. I'm content to see the retreat summaries on Flosstube. You will find your niche and I hope it is just right for you. Happy belated birthday, Carol! We share a birth month, as you know, and today is my birthday! :-) What a wonderful gift, to see a post from you today. Where do I start? So many things I want to tell you. First, before I forget, I "retired" in March of last year when I went on disability, and it was a huge adjustment. First, there was being home alone all day to get used to. Then, it was trying to discover my new sense of purpose. For me, it saved me to make to-do lists at bedtime. I always put more on my to-do list than I thought I could accomplish, and every day I was able to cross off most everything. My husband was amazed at how much I got done each day, and it gave me an immense sense of accomplishment. Second, since I have been sick, I have learned to just enjoy do-nothing days, because feeling good and doing things you love is very important. When I don't feel good or have energy, I crave those days. Hurray for you for helping your in-laws. You are amazing! I wish more people had people like you in their corner. Take care, my friend, and I hope you have a wonderful February! Happy belated birthday Carol. It looks like it was very special. Your husband is so sweet and knows you so well. I know it was hard not to have any of the boys home but you know you were in all their thoughts on your special day. Your gifts from friends were awesome and so kind. I love your new stitch on black and the beaded trim is gorgeous. Stitching over one on black must have been a chore but it came out perfect. I see you got lots of hometown holiday patterns...they are so much fun to stitch. That was a big chore you took on in Florida but how special that your in laws had you and your husband there to make it home again. I'm so happy to hear they are settled once again. My good friends lost everything over at Flagler Beach and they are still redoing everything. It is a long process. I will keep your youngest in my prayers for a safe return. Beautifully stitched ornaments Carol,Snow Sampler looks fantastic on black fabric.Your husband's gifts for your birthday are lovely,very thoughtful, as are the gifts from your friends. 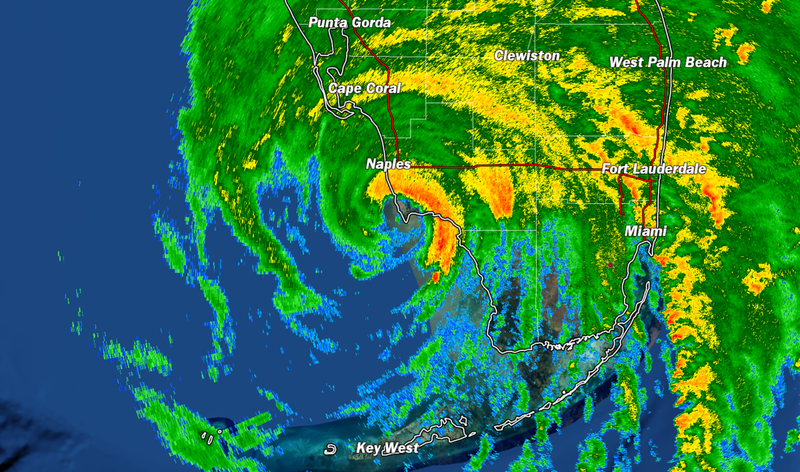 It is good to hear your in laws are once again able live in their Florida home. Happy belated birthday. 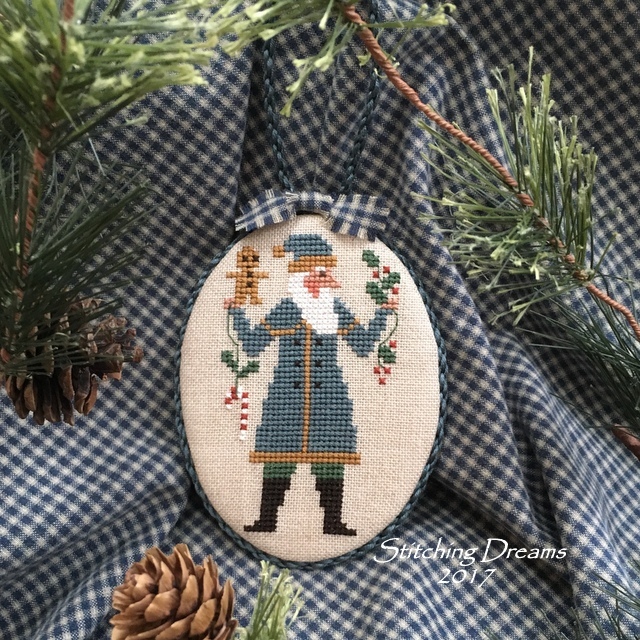 I love all your stitched ornaments. I love the stitching on black fabric. But it takes me so much longer to work on it. Loved your post from start to finish. 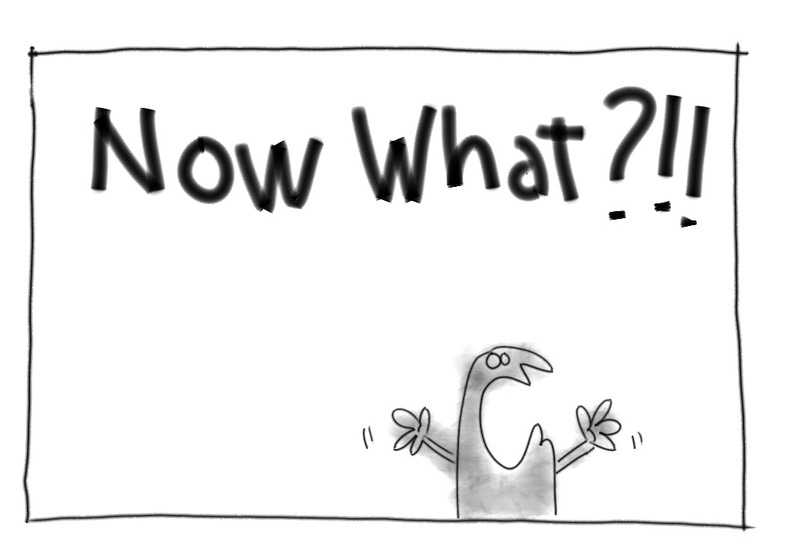 My life has changed drastically in the last couple years with 3 out of 4 of my children graduating high school, etc.. so I relate to your "what now" feelings. I am praying for you, but I know whatever you decide to do will add beauty and love to the world. Lots of beautiful stitching as always but your snow sampler over 1 just blows me away!! It is stunning and I’m totally in awe as I’m struggling to finish a set of ornaments stitched on black 28count over 2! Even with a magnifier and lights etc I am finding it hard going... I can totally see how the big change of retirement would hit you harder now, January is a tough month & change is harder! My own situation is somewhat different but I have watched my neighbor (who reluctantly retired last year at 64) gradually adjust and I’m sure you will find your way too. I’m glad you were treated to cake & stitchy goodies for your birthday, even if you couldn’t share your special day with your whole family. I hope you have a lovely February and enjoy the lengthening days as we head towards Spring! Happy Birthday Carol! Yummy cupcake and lots of charts and gift certificates and a nice dinner - wow! Your over one on black looks wonderful. As to retirement, I do know that some people need a schedule - meals at certain times, tasks on certain days - grocery shopping, laundry etc. I certainly encourage to you to volunteer! I read to a kindergardener and 1st grade each week - love it! My mom also works serving meals to homeless / low-income - you might also look into a hobby / interest that you and your husband could share. I of course recommend bird watching - I'm sure there is a local Audubon group which would lead local bird watching tours, etc. It takes a while to get it all figured out. I love that Snow Sampler. I have got to order it. have fun with your birthday gifts! All of your ornament finishes are adorable, Carol! Love the one with the black background stitched one-over-one -- I just can't imagine! A belated happy birthday to you. You will have fun stitching up all of your new charts. And don't worry about retirement. I'm sure that, given a little bit of time, you'll discover a new pastime or two that will be meaningful and fulfilling. Happy Belated Birthday Carol and happy stitching. Sounds like you had a wonderful time with your middle son and DIL. The cupcakes look Yummy and enjoy those wonderful charts. So happy to see you read Ann's blog and love her granola! You'll find your niche in retirement. I've heard many retirees say they wonder how they found time to work, and I'll be you'll say that soon. Snow Sampler is so cool on black! Your 2 gift ornaments are too, love the blue Santa. Mmmm, those cupcakes look delicious! I'm glad you got your in-laws back to some kind of normal, it must've been pretty scary for them. That Granola looks so good. Dear Carol, I wish you a belated Happy Birthday! Your white on black ornament is really nice. Lovely stitching post, love the stitching work on the black looks wonderful. So happy to hear you had a good Birthday , your hubby is a dream to buy you all those charts . It takes time to adjust Carol , once the Spring is here you will love being retired . I always feel my days up now , just not enough hours in the day. Enjoy February , it's a good month for planning your new year. Dear Carol, What a lovely birthday you had! I enjoyed reading about your celebrations and gifts. Last night I tried the granola recipe with great success. I cut down the sugar and maple syrup by more than half (and added some water) and the result was perfect for me and my hubby as we don't like things too sweet. I will definitely make it again. Your ornaments turned out beautiful as usual. I enjoy seeing your stitching and I'm going to try that beading method on an ornament I'm making for an exchange. I hope you find a schedule that works for you. Carol, belated birthday wishes. My birthday is also in January, but not as wonderful and exciting as yours. Love the Snow Sampler on the black. It looks stunning. Your P.S. ornaments are also beautiful. You sure do have "an eye" for finishing. I can't give you any suggestions for your retirement time. I've been retired now for almost 20 years and still can't figure out where my time/days go. I so en;joy reading your blog every month, and looking forward to Februarys and more ornament finishes. Beautiful finishes! Looks like you had a wonderful birthday. I, too, am counting down the days until Spring. Happy belated birthday Carol! You received such wonderful gifts. I always like it when gifts really reflect the person they are being given too. In my opinion, your family did great!! Love your first ornament.I have never stitched on black. It looks like a challenge to me. You did great in Florida. It is never easy moving older folks. We did that for my step-mom years ago. Like you, I am ready to move on from Jan. We had a very rainy one!! Plus it was still getting dark very early. AS a retired person, I volunteered at a school. I think to do what you did makes sense. My teacher retired so I need to find another "job." Happy Birthday to you! It sounds like you've kept busy during your least favorite month of the year! Love, love, love the snow ornament on black. Over one on black, must surely be hard. I've never tried it! You sent some lovely ornaments and received wonderful birthday presents. A gift certificate to a stitching shop would be fantastic! Happy February! Hi Carol —. What a wonderful post you have shared with the rest of us! I truly enjoyed it and thank you for so much for that is fun and interesting to read. Your stitching is so beautiful - I’m so impressed with your talent and your incredible finishing abilities. I have about a million questions about how you finish these truly beautiful works. Looks like you had a very happy birthday - cupcakes and lots of stitching projects. Fabulous!! It was also very interesting to read about your time in Naples, FL. I’m sure your husband’s parents are so happy, grateful and know how lucky they are to have had all of your help getting them settled again back in their home. What a terrible event for them to have to go through, especially at this time in their lives. I truly hope they are doing well and adjusting to everything. Those beaded edges do take time don't they, but so effective and pretty too. Love the PS santa, I really must stitch some of those myself, I say that every time I see one of yours! Wishing the inlaws peace and happiness in their newly furnished home, I am sure with your help it looks and feels very homely to them with all the new things. You'll get sorted with retirement, take it easy and enjoy the journey. 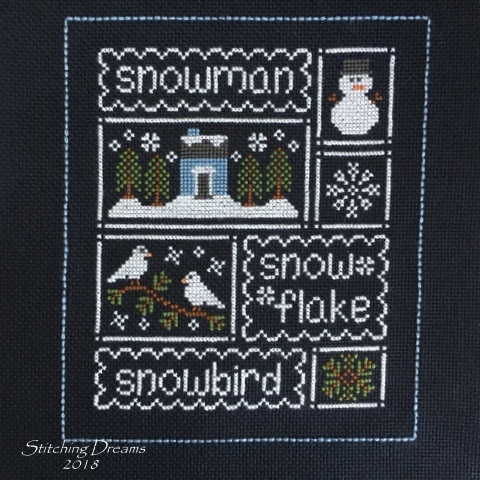 Oh my I just LOVE that Snow Sampler on the black fabric. I wish I could see to stitch over one on 28 count black! Happy Belated Birthday. It sounds like it was a good one! Thanks for the link to the granola recipe! It's so normal to worry about your kids regardless of their age! I know you will breathe a sigh of relief when your son is back home! I'm not retired but a friend is and she said she still keeps her days very structured. She gets a LOT done. One day is designated for all errands, dr. appts etc. She said you can waste a lot of time if you have appts outside the house every day. It's makes sense to me! There was a year I didn't work and I found it very satisfying to volunteer at our local elementary school offering reading tutorship to 3 2nd graders. They loved it but I loved it too. Very satisfying. I do believe we need to give back when we retire. It's good for us but it's also so good for our communities. Your ornaments are lovely - your changes always look perfect! Such delightful birthday goodies ... Oh, wow - did your husband pick out those charts for you? Your finished ornaments are so pretty, Carol! And yes, birthdays do seem to come around more frequently, but I guess so long as they keep coming around that is a good thing. : ) Your husband -- oh my goodness! You have a wonderful selection of charts to choose from! And those cupcakes! I'm sure your in-laws appreciated all of your hard work helping to get them settled. I too like at least a little structure to my day, and I think volunteering is a wonderful idea and one that would be very rewarding. Over the last year, I have been volunteering at the food bank and at an organization that helps the homeless, and it has been time very well spent. I can only imagine your concern and worry over your son -- I will keep you both in my prayers. Sending hugs! The snow sampler ornament is just gorgeous! Your ornaments are just lovely as always. Monaco is my go-to for over one projects. I know how hard it is to start over from scratch. My sister lost her house to a tornado once. They didn’t even have the clothes on their backs because they were covered in glass. I couldn’t imagine doing it at 90! This is us? I don’t know why I watch it, I’m always such a blubbering mess after! It’s storytelling is unique and so fresh. I am also trying to find my base since I left my job. It’s been hard since Dash has a schedule change every month so just as I get used to things I’m upended again. My prayers for your son’s safety. A belated Happy Birthday to you, Carol. Your black ornament is so pretty. I haven't tried the bugle bead edge, but will check out that tutorial. I will retire in June and already have some concerns about filling my time rather than just wasting it. Volunteer work or maybe even a part-time job. After all, there's only so much stitching and reading you can do before even that gets old. You had so much going on in January Carol! Love the stitching as always and those birthday presents look great! Glad you were able to get your in-laws re-settled. I don’t know anything about retirement myself, but my former boss told me that the secret for her was making sure she had one thing on the calendar each day - even if a haircut or meeting a friend at the gym - so she’d have something she had to get up and going’s for. I am sure it is a big adjustment! And I am sure there are many places that would love to have you as a volunteer. Can’t wait to watch This Is Us Sunday night. I’ll be staying up late to see how it all goes down...and no doubt crying along the way! Hope you have a nice weekend! Your Snow sampler is very beautiful, love the beads around the ornament. Yes, it takes time but the result is adorable! Both of your Christmas gifts are so pretty! Wonderful gift from your husband! Can't wait for see what you will do with the LHN designs! You have such a good eye and your finishes are always so nice. If you mentioned that on your blog, I bet you'd have a tremendous response. Happy belated Birthday! I'm sorry you've been feeling down and without a sense of purpose. Not having your sons around for your birthday probably didn't help. :( I admire you and your DH for doing all that hard work setting up your in-laws' house for them. So glad they are back in their house -- hope they feel at home now. I hope you find yourself happier and more peaceful soon. I'm sure you will get accustomed to retirement in time. Can you make some sort of work schedule for yourself, have a look around for volunteering, but don't run yourself ragged, you still need time for yourself. With winter coming to an end soon perhaps Spring might bring a better outlook for you. Hi Carol - I just noticed the new picture on your blog header. So beautiful and so beautiful for February and Valentine’s Day - love it! Hope all is going well for you. We are experiencing a true winter day today — a fair amount of snow, fairly cold and we get to shovel the sidewalks —.how much fun is that? What a wonderful post, Carol. Your three newly finished ornies are just gorgeous as always! You are so very talented. I would like to wish you a very happy birthday and I say, roll on retirement - enjoy every minute of it! I love, love, LOVE the black fabric with white stitching!! You have been busy Carol! I'm sure your in laws are settling in to their new home, and I hope your eldest son is safely home now. Your ornaments are stunning, I especially like the one for Gabi, such a classic. And one over one on 28 count black, you certainly are brave! Wishing you a belated very happy birthday! First of all: Happy Belated Birthday, Carol. Wonderful, all your stitchy gifts from your husband and sons. And the wonderful gifts from June and Cindy. What a change to celebrate your birthday without your sons for the first time. It feels strange at the beginning, of course, but with the time it becomes a habit. And if one day your sons will be present again, it will be an extra special birthday. I love your first ornament this year. And yes, you are right, the edges with beads are really a bit time-consuming. But also very rewarding as they look so beautiful. I also love the two PS ornaments you made for your friends. Great stitching and finishing as usual. Good to hear that you could help your in.laws to make their new home after the horrible devastations by Hurricane Irma. No doubt that you and your husband had to work for many hours so that your in-laws could finally feel at home again. Unfortunately I can't help you when it comes to retirement. I love to get up in the morning and to have the day wide open in front of me thinking what I would love doing. But some of my retired teacher colleagues volunteer in various fields and they are very happy doing so. So why not try this? Could be the perfect solution for you. Like you I just wait for spring to make its appearance with the first little flowers in the gardens and the first shy leaves on bushes and trees. I'm looking forward to it. Snow Sampler is looking lovely and both the ornaments are great. Happy Birthday, you got some lovely gifts. I can't give you any advice on retirement as I have the opposite problem just having gone back to full time work! Carol, tuo marito è fantastico! Regali meravigliosi, si vede che ti ama tanto. E i tuoi ricami sono sempre eleganti, grazie per il tutorial è molto utile, voglio provare anch'io! Per la pensione, vedrai che impegnarti nel volontariato serve molto, cerca di rilassarti e godere le piccole cose. Un abbraccio! Beautifully stitched Snow Sampler, don´t think I could stitch on black and I like the Prairie Schooler design and pretty finish. Wonderful gifts from husband, son and fellow bloggers - such a pretty scarf from June. The Snow Sampler is so impressive on black fabric. The gifts you made and those that you received for your birthday are lovely. Sounds as if you were working hard in Florida but I'm sure your in-laws appreciated all your effort.